I’ve been visiting and reviewing fitness studios in Dallas for five years now. I love all the variety and the unique workouts Dallas has to offer. So with 2019 here, I often get asked, “Where should I work out?” My answer: You need StudioHop or ClassPass. These are great options for anyone who isn’t sure what they like, are looking to find a new “home”, or are bored with the gym. I’m breaking down all you need to know about the following multi-studio memberships available to you in Dallas and Fort Worth. StudioHop is a Dallas-based company offering memberships to a variety of high end fitness studios in Dallas, Fort Worth, Austin, San Antonio, Oklahoma City, Tulsa, and New Orleans. The studios offer a variety of studio options to try, an online community to connect with others, and local perks and discounts. How it Works: Once you sign up for your membership, you have access to all their studios from one platform and are able to sign up for studio or class you’d like. Peruse different studios, find a class, click reserve, and voila! You’re all set. Just show up to class and check in like you would if you were a member there. Membership Options: StudioHop offers 2 main membership options in DFW and a trial option. If you want to dip your toes into the fitness world, you can purchase Visit Bundle where you can take 4-8 classes a month. If you’re looking for more of a true membership experience, you can check out their more inclusive option called their StudioHop Pro plan. This plan allows you to visit a studio up to 20 times a month depending on the tier you choose, so it feels like you have a membership at one studio with the flexibility to check out others. There are no black-out class times to any of the partner studio’s schedule. In each plan is a different tier that breaks out into the studio type. More info on the tiers can be found here. Perks: The StudioHop team is also working hard to provide added perks. In the membership, they’ve also enlisted cryo spas, offer discounts for certain businesses and more. All members are also added to their Facebook community group where members can ask questions, share victories, stay on top of the latest news, and get in touch with the SH team immediately. Also, you can use your membership in any of the cities in Texas and Oklahoma that currently offer StudioHop. Also, if you refer a friend, you both get 10% of your monthly plan. Sharing is caring you guys! Studios:There are currently over 200 studios on StudioHop in Dallas-Fort Worth and they are always adding more. Choose from yoga, Pilates, barre, kickboxing, HIIT, bootcamp, aerial yoga, spin, and more. StudioHop is very selective with the studios they accept and offer to their members. Their standard is to only offer the best studio options. The Fine Print: It’s a month-to-month membership, so no annual contracts or additional fees. There are caps for the number of times you visit a studio. Just read the different tiers before choosing a plan that works for you. There is a fee to put your account on hold. Also, late cancels will incur a $12 charge and $15 for no shows. Who I’d recommend this to: If you want more of a membership experience a few of your favorite studios, StudioHop has that option since you’re able to visit a studio more than a handful of times in a month. It’s a great alternative to paying for one studio membership. I’m currently a StudioHop member and have loved being part of the community. You can catch my review here. I use the Visit Bundle in addition to my gym membership. This allows me to supplement my gym workouts with yoga or another fun class and I love the perks. I’d recommend StudioHop for people who live in Dallas proper. StudioHop continues to add more North Dallas studios (currently 40 studios in North Dallas), however this membership makes the most sense for people who either live or work in Dallas. The majority of their studios are in central Dallas and they are currently building out their studio partners in Fort Worth. Anyone who lives outside of central Dallas or in the further suburbs won’t have as many options to choose from and wouldn’t be able to take advantage of all the studio offerings unless they are willing to drive. How to sign up: Go to the website where you can select the membership option that fits your lifestyle best and get to hopping! Use my affiliate link here and PROMO code dff20 for $20 off your first month of the any StudioHop plan except the trials. 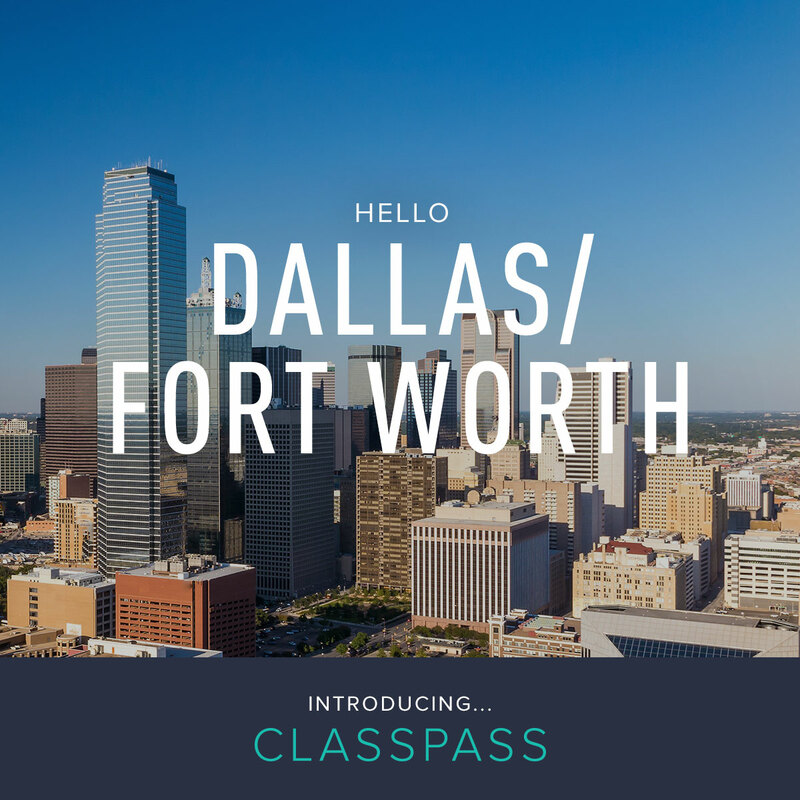 ClassPass started in New York and expanded nationally and to Dallas a few years ago. They are definitely a larger company and are currently in almost every major city in the U.S. I had the pleasure of testing their platform and visiting studios all over DFW when it first launched in 2014. They offer access to a variety of different studios and gyms in DFW. How It Works: Similar to StudioHop, they offer multiple membership options depending on your needs. Once you’ve signed up, use their online platform or app to book classes and break a sweat. Membership Options: ClassPass currently offers 3 plans based on credits to redeem for classes and your first month as a new client is actually free. Each plan provides a set number of credits per month that can be used to redeem different classes. Class values vary depending on studio so 21 credits in the first plan can get you between 2-4 classes in a month. Up to 10 credits do rollover if you don’t use them to the following month and you can purchase additional credits. More on the plans here. Perks: For travelers, your membership can be used in any city. ClassPass is readily available in 50 cities making it convenient to find a workout when you’re traveling. You can book easily using their app and can learn more about that here. Select cryo or recovery spas are also on ClassPass. You can also invite a friend that isn’t a member to take a class with you for free and their referral program offers $30 off for both you and your friend when they sign up. Studios: ClassPass has a broader There are over 300+ studios and gyms on ClassPass in DFW right now and you can see some of them here. You also are able to book gym time in select gyms or access their free library of workout videos or app workouts too using Classpass Live or ClassPass Go. The Fine Print: There doesn’t seem to be a cap on how many times you visit the same studio, however they will increase the number of credits it takes to redeem a class after you’ve visited several times in one billing period. Also, the more high end or popular classes will require more credits versus less popular studios. Who’d I’d Recommend this to: This is a good option for anyone that lives in Dallas, the suburbs and beyond since they include aim offer access to almost every studio. This is also a great option for major travelers like to work out in different cities. Since ClassPass is a larger company, they offer more studios in their program and don’t limit based on a certain criteria. It’s much easier to find studios. Overall, I think ClassPass offers a cheaper price point, but with restrictions. How to sign up: Visit their site and sign up here. The Takeaway: Location, budget, community, and lifestyle will help you determine which option is best for you. This is a great way to sample different studios you’ve been curious about without spending a ton on drop-in rates. $15-$20 a pop does add up! Hopefully this was a helpful breakdown of both services. Is there anything I miss or do you have a questions about StudioHop or ClassPass? Drop a comment below and I’ll do my best to get you the right info! Thank you for the class pass link. I got wait listed but then used your link I got set up right away! Thanks again! Great reviews on both! I love the idea of both of them, but I agree, location is key. Thank you for breaking it down and comparing them. You took all of the guess-work out for me. haha true! eventually you’ll crave more from your workouts. I know I’m at that tipping point in wanting a little more consistency.